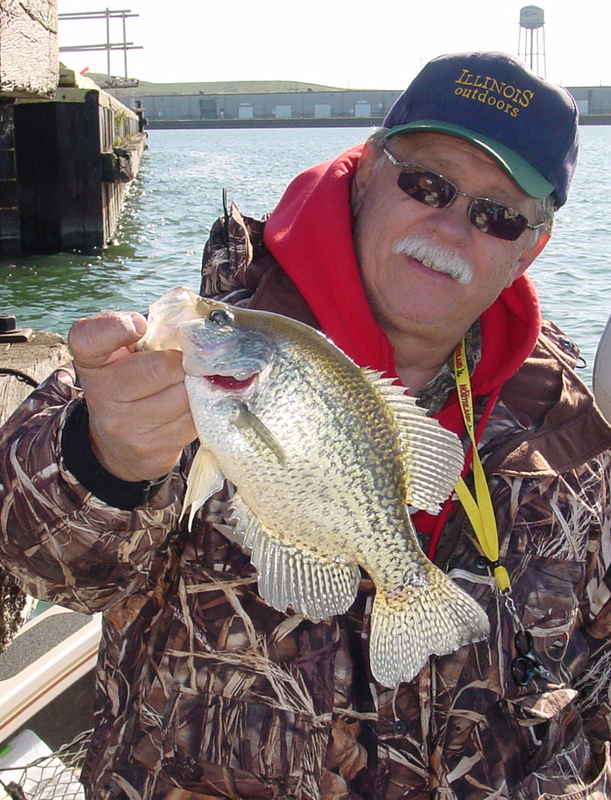 Be it in Lake Calumet or the Illinois River, crappie fishing will be great in December. Whoa! Crappie fishing in December? You bet! It really is the best time of year to get some good sized crappies. You can fish the areas that you’ll read about in a moment through the spring summer and fall, but the biggest crappies of the year will be on the end of your line when you fish one of these two bodies of water this month. Lake Calumet is a great place to find slab sized crappies in December before a big chill comes in and ice forms on the lake. Since access is by way of the Calumet River, it will be easy to get out. Don’t worry about the big freeze, it will take awhile for the river to freeze up. So no matter what, December is still a pretty safe bet to try this area for crappies. You’ll find a number of steel pilings in the lake and that is exactly where you want to fish. I’ll get into baits in just a moment. It’s the vertical structure that these big fish will relate to and hold upon. You’ll have to jump from one piling to the next. A point that is found at the opening of the little bay by the silos is another good deep vertical hole. Check that out. As you leave the lake just a short distance up river are a bunch of old wood pilings. Fish those too. Crappies will be on them. I fished there many times and always caught one smallmouth bass while fishing for crappies. When I did a TV show there once, I talked about the resident smallie. I caught him again on camera. The Illinois River has good crappie too. Again, I’ve fished this river for crappies many times and always did my best in the month of December. It’s the same story here. No matter where you are on the river, look for steel or wood pilings and fish along side of them. My favorite spot is above the Starved Rock dam, north of the island by Buffalo Rock State Park. This spot is accessed within the Starved Rock pool (but more commonly known as the Ottawa Pool because of the ramp at Allan Park in Ottawa). The pilings here are all wood. But others are scattered along this industrial area. In the lower Peoria pool by Peru there are areas with pilings everywhere. The trick to getting the crappies in December is by getting up close to the pilings. Often I’ll fish them by starting at about four feet down. As time moves on, I’ll lower my baits to deeper depths. Picking up the fish from the top of the pile seems to not disturb the school as much as it would by catching them from the bottom of the school. Cubby Mini Mite II’s and one to one and a half inch tubes will work well. You’ll always get more fish and with more frequency when live bait is used. Crappie minnows are not a must, but a definite plus in December. Color for the tubes will vary but I find that white and red tubes work well. White or black Mini Mites are another favorite. I’m sure that you may have a favorite color. Believe it or not, confidence in a bait will work wonders because you will be more in tune on how to work the bait. If you like a different color, by all means, use it. Getting the baits up close to the structure is easy. But keeping them close could be difficult. Getting a bite and setting the hook can be a real trick if you’re using longer rods. Because you need to be so to the wood or steel, be prepared to bang up your rod. I tried something different this early winter. I’ve gone to my spots by boat but used long ice fishing rods because they really got me up close. Actually, it was a lot of fun catching crappies with these ultra light action rods. I could actually dangle a bait in the midst of a triangle structure of steel and still be able to lift a rod to set a hook without banging into anything. Give ice rods a try. You may enjoy this different approach to getting winter crappies. If your rod tips are sensitive enough, I recommend straight lining for the crappies. If you prefer to use a bobber, use a small slip bobber. Pencil bobbers are good. If you go without a bobber, you can still use the bobber knot to help mark your depth. Often you can be fishing from ten to twenty feet deep. I’ve been able to adjust the gain on my depth finder that has the transducer on the trolling motor so that I can watch the action of the jig. Once it is in the area of the fish, I can move it closer to the structure where it would get lost from the depth finder screen. The Illinois River and Lake Calumet; they are great places for crappie fishing in December. One nice thing is that few boaters will be on the water. You’ll have the lake and rivers almost to yourself. You may see some guy out there in a wrapped Crestliner and that would be me. I really enjoy this kind of fishing because it’s fun and such great fishing is not that far away.